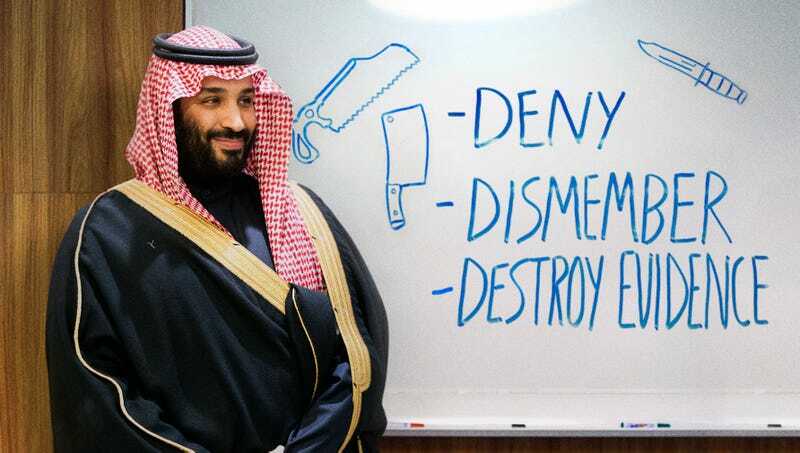 BUENOS AIRES—Saying the hour-long presentation based on His Royal Highness’ own professional experience was really enlightening, member leaders at the G20 Summit attended the Saudi Crown Prince’s informative seminar Friday on eliminating dissident journalists. “He really explained things in simple terms that any head of state could understand and modify based on his or her needs for eliminating antagonistic reporters in their own country,” said Mexican president Enrique Peña Nieto, one of the many world leaders to attend the crown prince’s sold-out workshop that covered a wide range of subjects, including tips on ensuring that a kill squad works as a team, procedures for deleting and altering CCTV footage, and a list of several venue options for keeping an assassination convenient and confidential. “Prince Salman used helpful activities like having us role-play a network interview in which we contradict the media to supplant our own narrative on the disappearance of a journalist to make a serious topic fun. I can’t wait to try these easy and effective torture techniques he showed us, and I’ll definitely be applying the prince’s ‘Three Ds’ approach of dismember, destroy evidence, and deny to my next press killing.” Nieto added that by the end of the class, he was a devoted practitioner of the crown prince’s methods and announced he was completely convinced that the Saudis had nothing to do with the murder of Jamal Khashoggi.